Patios vs Decks. Which One is Better?? Patios vs Decks - Which One is Best for Your Backyard? Trying to decide which is better, decks or patios? If you're having trouble, maybe its because your not asking the right questions. This isn't a wrong or right, better or worse proposition. They are different, that's all! As such, they each have a place. Sometimes those places overlap - and sometimes only one choice will work. Lets take a look at the strengths, weaknesses, and particular requirements for each design, and see if we can help you with your decision. What is the contour of your backyard? Lets first consider the construction methods for each. A deck is built on supporting posts, with a series of beams and joists to hold up the decking. It really doesn't matter what the ground under the deck looks like. The support posts are shortened or lengthened to compensate for any irregular ground. A ground level patio, being built directly on the ground, needs a relatively flat and level area to start with. It doesn't have to be perfect, but if major grading work is necessary, a deck would probably be a better option. What is the elevation of your back door? Consider how far the threshold of your back door is from the ground. If your house is built on a slab, you may be able to step out of the house directly onto ground level. On the other hand, if your house is on a sloping lot, your back door may be ten feet or more from the ground. You do not want a situation where you have to use a lot of steps to get from door level to ground level. If you need more than two stair treads (three steps up, counting the step into the house), you'll probably be happier with a deck. Ideally, any more than one step is too much, but to each his or her own. Just be aware that every time you go into or out of the house , you, and your guests, will have to use those steps. Some folks ask about adding dirt beside the house so they can expand their options. That's possible, but then you have to be sure not to raise you exterior grade over the water proofing system of your foundation. Generally, I recommend a deck if you have more than two steps needed to get into the house - ideally, only one step should be required. If getting to and from ground level while carrying your food, supplies, etc. is too much trouble, you will find yourself using it less and less. The fact is, these two considerations (contour and elevation) usually determine which option is right for you. But that doesn't mean you can't get creative and still have what you want. You can always add a patio in another part of the yard if you have your heart set on that but your lot grade doesn't lend itself to that option at the house. Have a deck at the back door, to use when you need to go in and out more often. 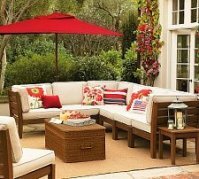 Put a patio in a shady area for quiet relaxation when you don't need to go in and out. Use your imagination, just make sure part of that imagination deals with the practical realities of how you will use a particular area. 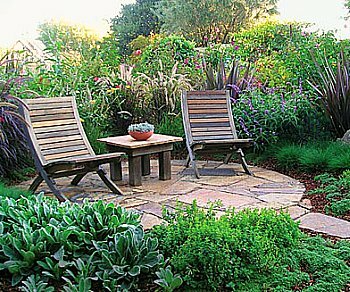 Once you have the area just outside the door taken care of, there are other things to consider as you design your backyard. What other amenities do you plan to add? Do you want to have a hot tub as part of your backyard design? If you do, a deck generally is not your best option. Hot tubs can be extremely heavy when full of water and people. That weight is obviously concentrated in one area, so a deck needs to be designed with that weight in mind. A patio is directly on the ground, so weight isn't as much of a consideration. Notice I didn't say it was of no consideration. An average 6 person hot tub weighs about 800 pounds, empty. Add 475 gallons of water at 8.34 pounds per gallon, and you have another 3961 pounds. Put six 180 pound people in and there's another 1080 pounds. So full of water and people, the hot weight can exceed 5800 pounds. That's almost three tons, or almost two small cars. Bigger tub, more weight. And if Aunt Mildred wants to get in the hot tub, forget about it! Of course, three others would have to get out, so that would help some. Actually, everybody would probably get out, but that's another story. You get the point. Hot tubs are very heavy. A 4 inch concrete slab would be an ideal base. You can always build a deck around the hot tub, after setting it on the base. If your existing deck is not too high, you may be able to cut a hole in it and recess the hot tub into the hole, after building a suitable base. If you simply must place a hot tub on your deck, I recommend getting an engineer to help with the design of the support. Don't just take the word of the hot tub salesman. He won't be the one in the hot tub if it falls through your deck to the ground. Ask him about his expertise with static versus dynamic weight calculations. The water and the people don't stay still, so the weight loading changes. I would never locate a hot tub where a person could possibly get under it. 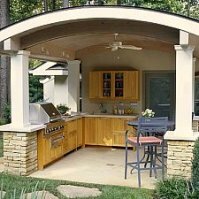 Do your plans include an outdoor kitchen? While the weight isn't usually as concentrated in one spot as with a hot tub, there can still be significant weight considerations. If you just plan on a nice portable grill, or a cart grill setup, a deck is probably fine. If you want to include cabinets, counter tops, and other appliances, you'll probably want to use a ground level design instead. If stone or brick will be part of your outdoor kitchen design, a deck is likely out of the question. How does maintenance fit into your decision? A patio normally requires much less maintenance than a deck. An occasional rinsing with a hose usually does the job. If it gets excessively dirty, you may need to pressure wash it. That's about it. Depending on the materials you use, there may be a periodic re-sealing necessary, but that's still fairly easy. A pressure treated wooden deck will need to be refinished every other year or so. Decks made of other materials may require less frequent maintenance, but they will still need far more attention than the average patio. The particular maintenance requirements for various materials are discussed in separate areas of this site. Which one is more durable and longlasting? Durability is determined by the choice of materials, particularly regarding decks. Pressure treated pine may need to be replaced in 15 years or so. Aluminum decking may last a lifetime, and there are numerous choices in between. 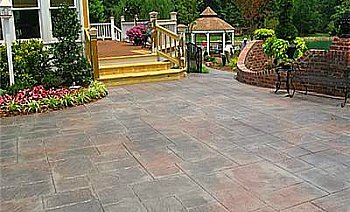 Concrete, stone, or pavers are typically viable as long as a house is, so once installed, they don't need replacement. Which costs more? A deck or a Patio? 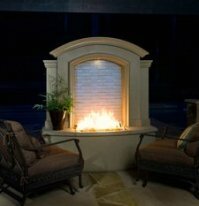 While there is some overlap between the high end materials and the low end materials; in general decks are more costly. For example, you can build a basic concrete slab for around one third of the cost per square foot of a basic pressure treated pine deck. Many backyards require a concrete pump truck to get the concrete to the pouring area. Even after adding around $700 for that, you will still save money with a patio. 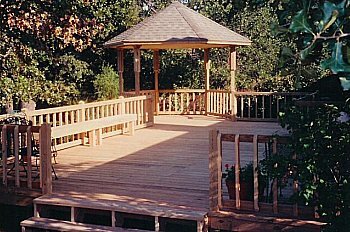 Of course, the particular materials used (discussed elsewhere on this site) can vary these costs greatly, whether a deck or a patio. Patios will support more weight, easier than decks. That's important for hot tubs and outdoor kitchens. 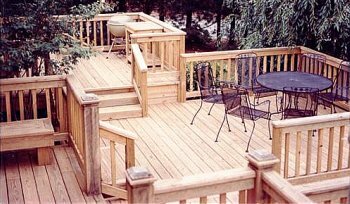 Decks generally require more frequent and more difficult maintenance. 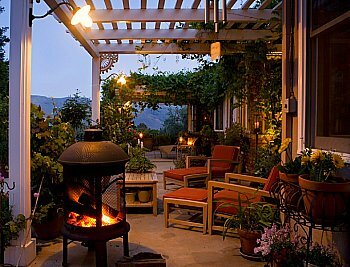 Patios usually last much longer than decks, although there are some exceptions depending upon deck materials. Decks are more expensive in general, although material choices may change that. So, lets see - in general, patios are stronger, more durable, require less upkeep, and cost less. Let me think... Tough choice. So does that mean decks are no good? NO!!! Both options have their places. Both will give you years of fun, good times and memories. So make it easy - build both!